Thank you very much to the folks at Michigan Bicycle Company for showing an interest in placing an ad on my humble blog. If you've not been on a bicycle since you were a kid, maybe this is the summer to rediscover the joy and freedom of what it arguably the fastest machine ever invented by man, when you factor in the energy it requires to build/buy and get on down the road. Or better yet, why not make your family vacation this summer a bicycle trip? It's inexpensive, eco-friendly, healthy, and, I bet, will give you memories to last a lifetime. His report offers tips under the titles of Going the Distance, Keeping it Simple and Cheap, Picking a Route, Don't Overspend, Pack Light, Safety First, Take a course on Safe Cycling, and Stay Cheap. My vacation begins next Friday, and I plan a couple of more long ones that I hope to take, camera in hand, and blog about. A Bicycle Built for 10 is causing concern in Amsterdam. Actually...some of these contraptions can apparently accomodate up to 22 people. There are lots of the contraptions on the street in this, um, Forward Thinking, city. The bike, which can seat at least 10 people around a central "bar" as they pedal through the city center, is a frequent sight in the Dutch capital and is said to be popular with stag and hen (bachelor and bachelorette) parties. A non-drinker steers the bike. But two accidents involving the bikes since the start of April has prompted the city councilor responsible for transport, Hans Gerson, to investigate how many bikes there are and whether they pose a problem. Dear LA City Council: Bring the Marathon and Bike Ride back to March! This year, in an unpopular decision, the LA Marathon / Acura LA Bike Tour was moved from its traditional date in early March to Memorial Day May 25th. That the date change has not met with wide approval is a major understatement! Because many participants go away for Memorial Day weekend many participants must make a decision whether to ride/run or go on their holiday. Returning to the traditional marathon day in early March would eliminate this problem. A petition has been created by Russ Pillar, President of the LA Marathon, that allows us a voice in persuading the Los Angeles City Council to vote to return to the original March date. If you ever have, or ever plan to, participate in the Bike Ride, or even the Marathon, please take a moment to follow the link below and sign the petition endorsing the return to the original Marathon date. I have pedaled in the 1998, 2001, and 2007 rides, and even blogged about the 2007 event in a 14 Part, picture filled, Series. A comment left on The Dude, this morning, led me to discover a new BikeBlogger, Gerhard, of GT in LA. Once all numbers were secured it was time for a final pit stop, bike and self check and head on over to the start line. This is the time when you can feel the high. There is an unmistakable energy and buzz which builds with every minute closer to the start. People smiling, talking excitedly, fidgeting, checking and re-checking gear, expressing hopes and fears and finally the “Whooo-hoooo’s” as the first group of 30 riders is allowed to leave the gate. His descriptions of the route, the weather, the stops, the people, and the ride, are vivid, exciting, and often humorous. 43 MPH on a downhill? I can't imagine! As I got into Hermosa Beach I noticed that I had someone on my tail and at the next red light I turned to see who the rider was. Turns out it was a tiny framed young woman. 3. "I started talking to myself, telling me to relax my grip, shift position, get out of the saddle, roll my shoulders, pedal without hands and just keep turning the pedals, over and over and over." 4. My favorite post is this one. My ride today felt like I was a tagged deer in open season. I rode 24 miles and I kid you not, had to come to a full emergency stop twice, got cut off by a car turning right three times, swerved around four car doors carelessly flung open and barely avoided a motorcycle shooting out of a stop street disregarding the ‘STOP’ in it all together. Today’s more than usual ‘bullets’ got me thinking about the recent movements, such as ‘bike to work week’ and ‘bike for life’ initiatives. Whereas I really support these noble quests in principle, how realistic are they for the average rider? What follows is a thoughtful, thought-provoking, essay on cyclists, safe cycling, the places one rides in Los Angeles, and motorists, parked cars, and other things one encounters while in the saddle. One of the biggest problems to overcome, perhaps even bigger than the inaction by city, state and fed, is the mental approach of motorists towards cyclists. The culture does not support the existence of the cyclist, who is seen as a nuisance on the road, an annoying bug to be squashed. Cyclists take too much time to get through intersections, take up valuable real estate and often behave as if traffic laws do not apply to them. Yes, many of our fellow cyclists are responsible for an unfavorable view of us as a whole. And then, yes, my absolute favorite, the interest groups. Critical Mass and one of their underground off-shoot called Crimaminal_Mass, riding on the freeway, to prove what point? In my opinion these organizations do more harm than good. Read his piece called Open Season. Gerhard is a fan of this blog, it appears, as it's in his Blogroll, and now I'm returning the favor by adding him to mine, and the above 4 posts are a good reason for you to check him out for yourself. Cars, SUV's, RV's, Busses, and Trucks, OH, MY!! As I wrote in Dec., when I first reported on the 3 Feet Please Movement, it doesn't matter how safe a bicyclist you are, no matter how properly you share the road with the 4 to 18-Wheeler Majority, the problem of how close, is too close, is of concern to Recreational Cyclists, and Bike Commuters, alike, every single day. The US states with "3 Foot Laws" are: Florida, Connecticut, New Hampshire, Oregon, Illinois, Tennessee, Minnesota, Utah, Wisconsin, Arizona, South Carolina, Washington, Oklahoma, and Maine... and other states aren't far behind. In fact, Colorado recently enacted a law that includes a 3 Feet Requirement. What can people in the other states, and in countries around the world, do to get others to get on board? "The battle for space between cyclists and motorists is intensifying--worldwide. And the need for space has never been greater. More must be done to educate motorists of the importance of sharing our roads and giving cyclists at least 3 feet of clearance when passing. As a cyclist who spends a lot of time on the roads in traffic I have experienced numerous close calls. After one frustrating ride I decided to act. 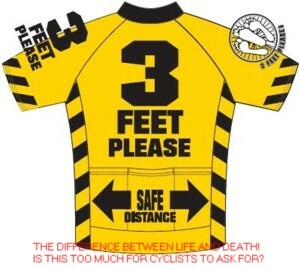 I designed a jersey with the words "3 Feet Please" on the back. I shared this idea with several fellow cyclists who thought this could make a difference." I, too, think it will help. If nothing else it will get the attention of those we share the road with. Check out the website of the 3 Feet Please Worldwide Campaign. On the Media Page of the website is an amazing 5 min. video report by Fox News in Wisconsin. It has footage that will blow you away. Jeff Frings is an ordinary cyclist, and he’s tired of being treated unfairly on the roadways. His experiences show it’s not just ordinary motorists who put us at risk, it’s municipal workers and even police officers. So he mounted a couple of video cameras to his bike and put together a blog. His hard work has successfully gotten the authorities to issue motorists a number of reprimands and traffic citations, and his blog has gained national attention thanks to an article in Velo News. Check out Jeff's Bike Blog for more information. There are people who are wearing/selling jerseys or have started using cameras on rides and calling the police. Whatever they are doing, the point is they are doing something. I commend anyone who is trying to make the situation better. I would also urge anyone who is doing something to talk to your local media about your efforts. I think educating the public is the key to improving the situation. To all those who've had enough and decided it's time to do something, thanks and keep up the good work. As for my own humble efforts, I have a whole archive of personal investigative reports, photos, and reports on other stories: Share the Road, and Trail: Safety Matters! That story, with photo, can be read here. Recently Joe told me of a new site he has helped begin with Max Jones, a fellow Floridian, called Road Guardian... "the first worldwide tool to help cyclists report, mark and share cycling incidents and trouble spots." "The company name is SafeCycling, LLC, a for-profit corporation based in Tallahassee. Max is the tech guru who makes it all happen. Joe, well, he's the cyclist who wants to save other cyclists' lives and make cycling safer for everyone. RoadGuardian.com was Joe's idea… Max gave it life..."
To save lives by helping cyclists avoid risky roadways. There are a lot of wonderful roads to ride around the world and there are some roads that cyclists should avoid because they have problems, danger points, and troublesome histories as experienced by cyclists. This site offers cyclists a process for reporting, marking and sharing those danger points. This information will help cyclists plan their routes for safe experiences. And what's equally exciting is that by making cycling safer for existing cyclists we make cycling more attractive to non-cyclists. When non-cyclists become cyclists they increase the numbers of cyclists on the road and this makes it even safer for all cyclists… just think about what that means. You can learn more about how it works, and how to use it, on the detailed FAQ Page. I decided to give the site a try, by reporting the incident above, and signed up. Going to the Reporting Tool I found a collection of questions, and Info Logging Steps to go through. I had to choose an incident from Close call, Collision, Death, and Trouble Spot. I next entered the date, time, and location. Next I had to choose a Problem Type from Vehicle, Dog, Bicyclist, and Road Condition ( No, Pigeon, Cat, Jogger, and Pedestrian were not among the options to choose from ;-D ). Next I had to choose directions for me, and the Motorist from N, S, E, W, NW, NE, SW, SE. If the incident does not involve a Motorist then the Motorist direction is not answered. Next I had to describe the incident in my own words. The description is only as good, and as useful, as the contributor takes the time to make it, including the answers to all the other questions before and after, and that might be a problem if the contributor does not take the appropriate time, and effort to be helpful, and clear. Next I had to answer Yes or No to wether the incident was Harrassment. Next I had to answer Yes, or No to wether I filed Crash Report with the police. Next I clicked on Preview to allow the Google Map to change its image to that of the location I provided it, and watched as a Satellite View, with Street Names (The Hybrid, as opposed to simply the Map, or Satellite choices alone.) of the intersection, and its surroundings, appears. If all is as it should be you click "Yes, this is Correct", or if not, "Change Address". The map allows the person viewing it to move left, right, and up and down, and zoom in, or out. Once I approved it a Thank You note appeared, and I was done! To make sure all really went well I went to the Report Viewer Page. Once there I have several menus to chose options from in the Filter. I Chose Trouble Spot, United States, Long Beach, and hit Search. The map appears with the location marked with either a yellow marker for Close Call, Red for Collision, Black for Death, or Orange for Trouble Spot. Clicking on the marker brings a pop-up allowing you to read the incident report, and also see a street level view of the location. Road Guardian is a real cool tool, and while members don't have a page where all their personal reports can be found in 1 place, and there are still growing pains of a Technical Nature, that doesn't keep me from recommending the site. The reactions from motorists has, so far, been positive in the 2 weeks I've been wearing the shirts. Motorists of all types have given me a wide birth, and if I have taken the lane, as I do for 4 miles on the ride thru Long Beach, no-one has honked their horn, instead just going around me in the lane to my left. On the bus I've had a few people ask about the shirt, and the Bus drivers have gotten a kick out of them. New Discovery Down Under! Official Says Cycling Makes You 61% More Likely To Live! Sydney Body Art Ride, a 3 year old BikeBlog in Australia, reports on a study that opines that "despite the overwhelming health benefits associated with cycling, a dominant car culture and concerns about safety risks prevent many Australians from commuting by bicycle." The study compared Australian cycling conditions with overseas examples to highlight the many areas in which local cycling infrastructure needs updating. Read more, including links, here. In Colorado things are getting a little, um, rocky, with regards to the realionship between Motorists, and Cyclists. Legislators did, as Legislators do, pass new rules with regards to bicycles and vehicles road-sharing with a recent bicycle safety bill, set to take effect in August. Problem is...on narrow mountain roads motorists are getting mad about cyclists "taking the lane", and cyclist don't like getting honked at. Another source of aggravation is the fact that the new bicycle safety law was passed to protect cyclists, but the wording of the bill has left law enforcement agents with little options if a cyclist is being uncooperative. "There's nothing we can do about it," Pelle said. "Essentially, this law takes away our ability to enforce anything." The article points out some of the requirements of the new law (and links to the bill itself), all of which are simply common sense, including the "3 Feet" part directed at motorists. Read the article by Glorianne Scott at Examiner.com: Conflict on the road between bicyclists and drivers intensifies after bill signing. Gary Richards writes the Roadshow Column for the San Jose Mercury News, and yesterday spent most of a column sharing, and discussing, readers views on a recent bit of cyclist stupidity: The act of Car Punching. Apparently some cyclists think it's a brilliant idea to "intentionally dent cars when the driver does something that is dangerous for bicycles." In the case under discussion the cops rulled that the motorist was acting appropriately, but even if the motorist wasn't since when was a bit of excessive Cyclist "Road Rage" an appropriate way to respond? If caught you could be made to pay for the damage, at best, or, at worst, the motorist could be armed, and dangerous, and decide to chase you down, and blast you right out of the saddle. Now, I'll admit to staring down, or wagging the middle finger at, a misbehaving driver who puts me in danger, a time or 2 in my 49 years of life (If there is a Saint among us who HASN'T done 1, or both, at least once, I'd like to meet this Jesus on 2 Wheels! ), but I've learned over the years that it is far more constructive to attempt to talk to the driver if given the chance, and the person was receptive to my doing so. At best I educate the driver, at worst the driver looks bad by their behavior in response to my approach.